Round Two of the Minimoto Racing Club Of Ireland winter series took place at a very wet and windy Aghadowey last Saturday. It was the first time as a team manager for Ballyclare’s Jamie Hamilton, who is recovering from injuries sustained after a high-speed crash at the Isle of Man TT earlier this year. And, by all accounts, things went well. “It was certainly cold and wet but at the same time the craic was good. Glenn McCormick did brilliantly and Connor (Parkhill) had a decent day as well. All in all, it was well worth the effort and I am already looking forward to the next round in a couple of weeks’ time,” smiled Jamie. It was first time on tarmac for McCormick but he handled the new experience well and returned home with a second, two thirds and a fourth. As Glenn will be riding alongside Martin Barr and Graeme Irwin in next year’s Maxxis British Motocross Championship, it was a good chance to get his views on the news that the series will return to Desertmartin after a two-year absence. The track will host round four of the series on June 12. 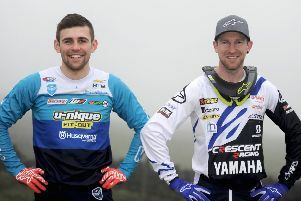 “Desertmartin is a good track and it is great to see it back. It will be nice to race in front of the home fans again,” he commented.